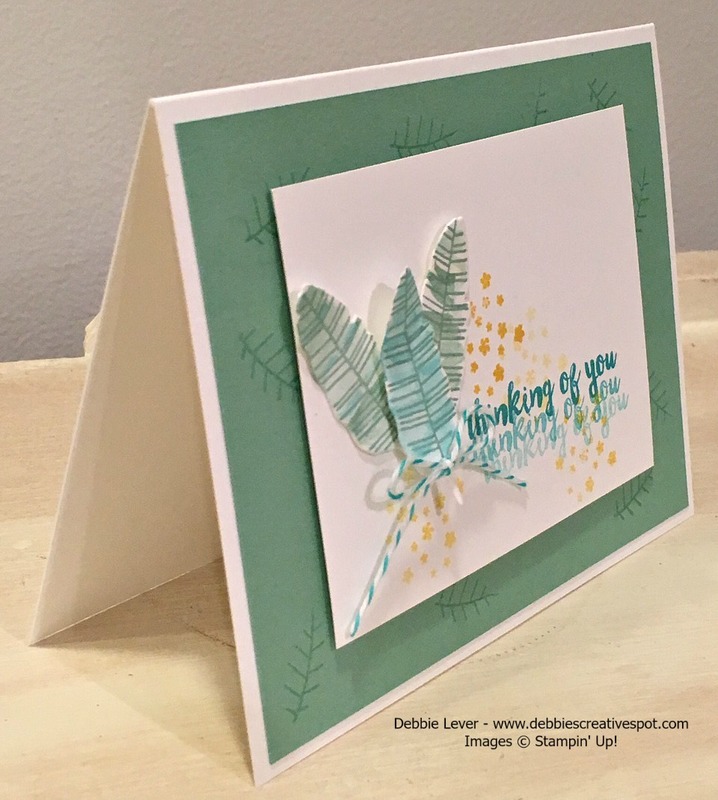 Debbie's Creative Spot: Botanical Blooms Bundle and LAST of the Weekly Deals! Botanical Blooms Bundle and LAST of the Weekly Deals! My card uses the Botanical Blooms stamp set and Botanical Builder Framelits Dies from the Stampin' Up! Occasions Catalog 2016. I used one of the leaves from the Framelits set and one of the stamps to create feathers! This was not my original idea, but I'll be darned if I can find where I got the idea from. I think the original card was smaller and I made mine a full size card. After the shapes were cut out, I stamped them with the leaf outline and Mint Macaron Ink. I filled in the color using an Aqua Painter and ink. The one leaf I added Bermuda Bay ink color to give some contrast. When the leaves were arranged in place, I stamped the small flowers around them using Crushed Curry Ink. 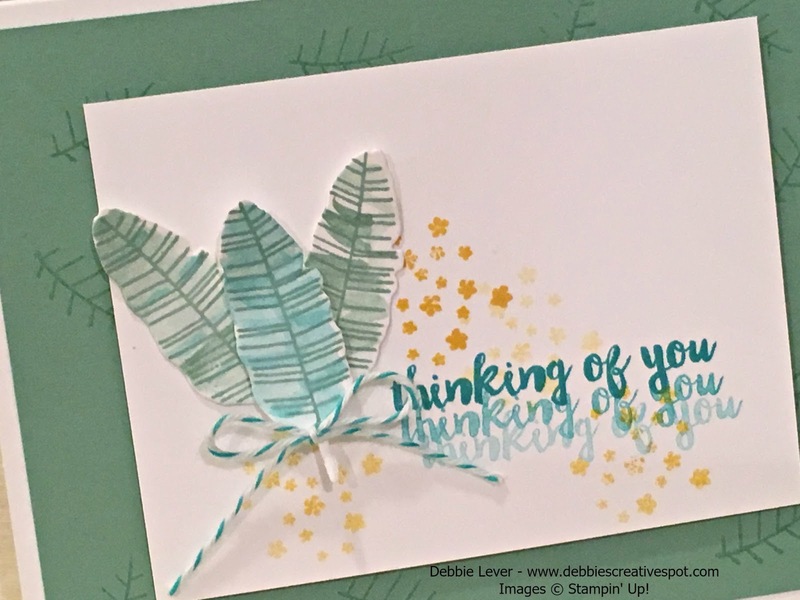 The words Thinking of You, come from my March, Paper Pumpkin Kit. ( Click Here to learn about Paper Pumpkin ). I inked once in Bermuda Bay ink and stamped it three times without re inking. Mint Macaron cardstock was used for the background and I simply stamped it using VersaMark Ink and one of the leaf outlines from the stamp set. A bow made from Bermuda Bay Bakers Twine finishes the design. This is the LAST week of deals as we know it! Stampin' Up! announced that they will have special offers every few months. 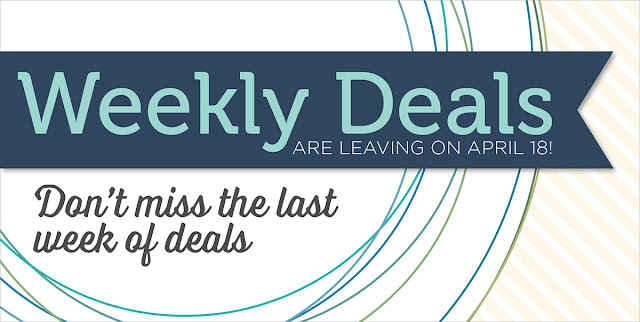 So, be sure and check out this weeks deals to SAVE on fabulous products April 12-18.